Campbell River residents have trusted their eye health and vision care to the professionals at Campbell River Optometry Centre for over 25 years. 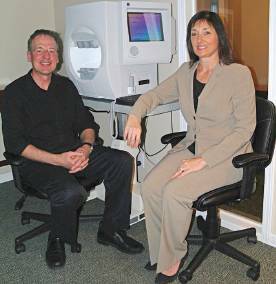 Optometrist Dr. Ghislaine Lauzon and Optician Don Huestis, her husband, are proud of that trust and are constantly updating their practice to ensure that their patients receive the kind of health care quality and vision correction that they deserve. Dr. Lauzon says: “The key to our practice is continuity and service. The rewarding part of my job is seeing familiar faces coming into my exam room and continuing to care for their eye health and vision through the years.” Dr. Lauzon is committed to providing her patients with the highest level of eye health care available. She and her husband have recently installed a brand new field analyser that detects problems with peripheral vision. The results are used to detect early signs of glaucoma, a disease that is becoming more and more common as the population ages. Dr. Lauzon also conducts specific pre-op testing for patients who want to correct vision issues with laser surgery. She also provides postoperative care. Huestis is constantly upgrading his finishing lab that has the capacity to grind prescription lenses on site in as little as an hour. For more information about Campbell River Optometry Centre and the services offered call 250-287-2020 and receptionist Kelly Kirkham will be pleased to help you.